An abscess most usually develops when a tooth is damaged through decay or injury, and infection has spread through the root canal system. 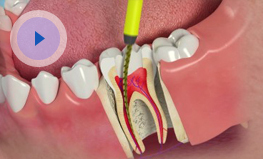 If this is the case, root canal treatment will be necessary otherwise a great deal of discomfort may be experienced. Root canal treatment is a very skilled procedure, usually taking two or more visits and is vital in preserving the healthy tooth structure. 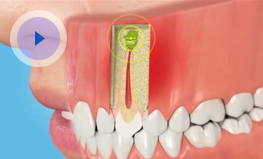 It also prevents infection spreading any further and the tooth is able to be restored to its natural look and feel. Swelling occurs for several reasons. If you have any type of gum swelling that has lasted for more than a few days you should contact Dental fx to make an appointment to be examined. Medications: Have you recently started taking medication? If so, your swollen gums may be a side effect of the drug. Brand switch: Have you recently changed your brand of toothpaste or mouthwash? If so, you may be sensitive to one or more of the ingredients. Poor nutrition: If you have had a change in diet recently and are not consuming as much fruit and veg, this can lead to a Vitamin C deficiency which in particular can cause inflamed gums. Gingivitis: This is the main cause of swollen gums. If you haven't been brushing and flossing as well as you usually do, this could be the cause. There are a number of other possible causes and contributors to gum inflammation (such as asbcess which is mentioned above). It is important to discuss your symptoms with one of the Dentists at Dental fx as this way we will be able to get an accurate and complete diagnosis and treat accordingly. If you think you have any kind of dental infection please call us at the earliest opportunity and we will make arrangements for you to be seen as soon as possible. Dental infections can occur for many reasons and are very treatable but the sooner we see you the better, in order to contain the infection and alleviate any pain or discomfort you may be experiencing.